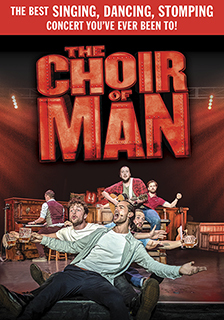 Imagine spending a night at the pub with nine wildly talented men who at any moment could break into boisterous song and foot-stomping joyful dance. The ingenious minds of Nic Doodson and Andrew Kay did just that and created the dynamic and delightfully kinetic Choir of Man. These lively and gifted performers and musicians plan to tumble, dance, play and sing their way through 90 minutes of pure entertainment. This feel-good show offers something for everyone and will no doubt “have you dancing down the aisles” (Broadway Baby).